November 11, 2018, Jupiter, FL – Mike Schippell’s once numerous starts have become less and less frequent over the years. That’s why he makes the most of them. 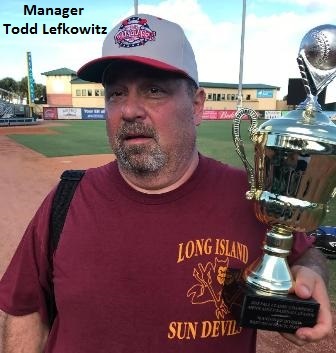 Schippell, who turns 50 years old this year, was masterful in tossing a four-hitter as the Long Island Sun Devils captured the 30+ Wood Bat championship with a 4-2 victory over defending champion Cleveland Steve’s Sports. “I don’t throw as hard as I used to, so I don’t try,” Schippell said. “My game is off-speed. Years ago I was a big strike out guy. 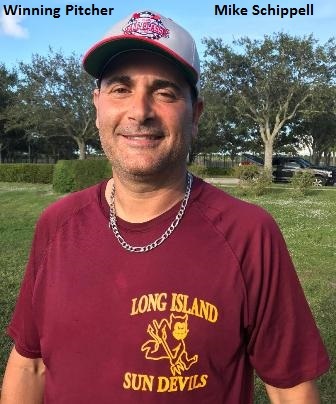 Today, I just didn’t want to put anything down the middle.” The veteran hurler, who stated that he only pitches two games per year – once in his home league playoffs and once in the Fall Classic tournament, allowed single runs in the first and fifth innings. Otherwise, he was nearly unhittable. Across the second, third, fourth, sixth, seventh and ninth innings, the righty allowed one base runner – courtesy of catcher’s interference. While only striking out three, Schippell consistently kept Cleveland Steve’s Sports hitters off balance with breaking balls and pitched to soft contact that was turned into key outs. Nearly matching Schippell pitch for pitch was Cleveland’s Bobby Hillier. The righty held Long Island to five hits, but was done in by three errors and one big swing. Cleveland led 1-0 after a walk and hit batsman set the stage for Keith McLeod’s two-out RBI single to right that plated Chuck Mechling. Hillier nursed the lead into the third before Cleveland’s defense and some timely Long Island hitting broke the game open. An error, a Rich Burgos infield single and catcher’s interference loaded the bases with one out. Hillier then induced a pop-out to set the stage for the biggest at-bat of the game. Ian Allen laced a line drive to left and when the ball was misplayed it rolled all the way to the wall for a three-run triple. Matt Gunning’s bloop double to center plated a fourth run and gave Long Island all the offense it would need. While Hillier struck out three and walked just one in suffering the tough-luck loss, Cleveland made several attempts to climb back into the game following the disastrous third inning. Bobby Mullen ended a string of 11 consecutive batters retired by Schippell when he laced a one-out double down the third-base line in the fifth. 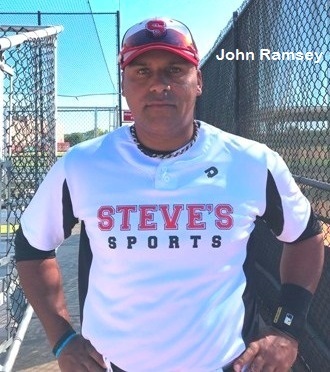 John Ramsey followed with a single to center that trimmed the deficit to 4-2 and moved to second on a ground out. But, when Schippell got a pop-up for the third out, the inning was over and so was another scoring threat. Long Island culminated a stellar week by finishing round-robin play 3-1, with its only loss an 8-2 setback to this same Cleveland team. The Sun Devils earned a berth in the championship game by topping the Coral Gables Athletics 5-2. 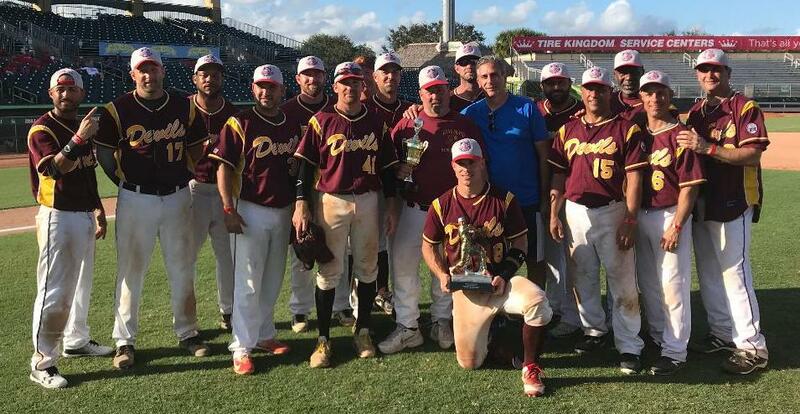 Meanwhile, Cleveland, which captured the 30+ National Holiday Classic championship and also suffered only one loss during round-robin play, reached its second consecutive Fall Classic title game by downing the Atlanta Dragons 8-3 in the semifinals. WP: Schippell. LP: Hillier. 2B: Mullen (C). 3B: Jackman (C). Allen (LI). Pitching: Hillier and Ramsey (C). Schippell and Allen (LI).